Prodigy Office Furniture has a variety of ranges and styles of boardroom tables available for immediate delivery, along with local manufacturers that make custom sizes and finishes. The boardroom is one of the most important rooms within a business and for that reason, it is crucial to select the right look and style for your organisation. An important part of selecting the boardroom table is to also select a style of chair to compliment the image that the boardroom deserves. Does your office need a professional interior look that will transform it into an organised environment? Although interiors like wall paint, floorings and other aspects matter a lot, the one thing that makes the first impression is the stylish and functional office furniture. Prodigy Office Furniture brings your office furniture that is built to high standards of strength and durability, with beautiful finishes that will catch the eye of any and all clients from the moment they step foot into the space. As one of the leading suppliers for premium, modern boardroom tables in Melbourne and across Australia we can deliver the right product to complete your boardroom. We provide tables in various sizes made from top-quality timber, ensuring your new table will also serve as a striking statement of design as well as a functional piece of furniture. We keep a wide collection of office products and store huge inventory to solve your office furniture problems, with our professional team just a call away. If you have just moved your business into a new location and need to set up a room or two right away, then we have the most light and portable yet durable office furniture products that we can supply to help business of all sizes fit-out their new home. Impress clients in your executive boardroom with Prodigy Office Furniture’s range of stunning products. Contact our team today to learn more about the range of boardroom chairs and tables we have for sale, all delivered at a competitive price. One furniture piece that has been applauded by our customers is our boardroom tables. 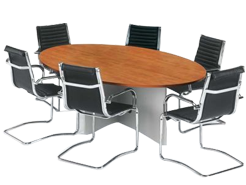 We supply our clients with quality boardroom tables in Dandenong, Melbourne. Our expert craftsmen and structural engineers produce something that has style and structural feasibility, designs that will complement your boardrooms greatly, building interest for the board members to give more lively and energetic presentations or proposals. With any classic or modern boardroom table you choose for your office, we also give options for height, base style, edge shapes etc. With the options above, you can make your board room inviting and a comfortable environment for your clients and delegates. If you want more flexibility with your furniture, then our portable boardroom tables in Dandenong might be the perfect choice. 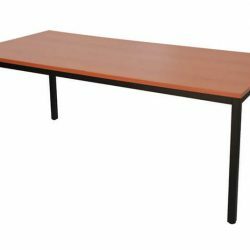 Portable boardroom tables are also compact, which means they can be easily folded and stored away somewhere in a corner and can be easily moved back into place and set up when the need arises. Our expert designers can also help you design your own boardroom table with a variety of base, material and finishing options. Apart from boardroom tables, we also supply a range of boardroom seating solutions with different base, cushion material, colour options etc. Prodigy Office Furniture is your guide to office furniture in Melbourne. 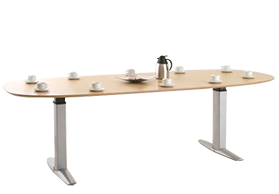 Give us a call on 03 9793 1222 to discuss your boardroom table designs and dimensions.